...or FHQ readers at least. Anyway, it strikes me as somewhat unfair that I get to pick what's in that section. So I thought I'd open the comments section up to suggestions for additions to that area. I mean, we do have a community of readers here and it is my preference that everyone have a stake in FHQ -- a minority stake, but a stake nonetheless. I put it to you, then, FHQ readers both vocal and silent: Are there sites you'd like to see included in that space and, if so, what are they? 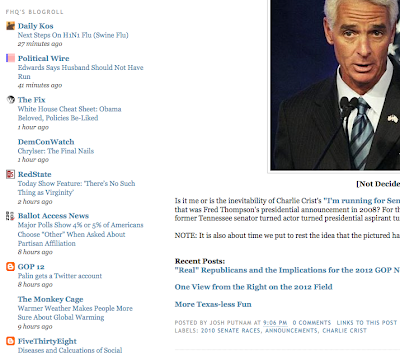 1) The sites have to be blog-like in that the widget requires an RSS feed. Some standard sites won't work. For example, CQ is frustratingly out of the loop for whatever reason. UPDATE: Well, maybe that wasn't a good example. Maybe, just maybe I wasn't trying hard enough to add CQ. Ha! [Hat tip to Matt from DemConWatch for the proper link.] CQ's now up. 2) There are only so many sites we can include before it gets overwhelmingly cluttered. That doesn't prevent you from suggesting something, but I feel the need to offer that disclaimer. Anyway, have at it. The suggestion box is now open. "How does this (Specter) impact the chances of more switches? I've seen speculation about Snowe. Your take? "I don't really think the idea of Snowe switching parties makes much sense. Specter switched because of electoral pressure to do so. Jeffords switched at a time when control of the Senate was in the balance. Neither of these incentives are available to Snowe, Collins, Inhofe or whoever would consider switching." 2) It could be that one or both of them just simply gets sick being a part of a party that is philosophically different from themselves. Specter spoke along those lines, but I don't know that anyone took him too terribly seriously there. His was a move of electoral survival. As I said above, that doesn't really exist in Snowe's or Collins' case. However, the Democrats are pushing the agenda now and the matters that they bring up for a vote could continually put Snowe and Collins in the uncomfortable position of having to decide between their convictions and their party. The more that happens, the more likely, I'd say, they are to reconsider their positions within the Republican Caucus. Ultimately, I think they'll stick it out (famous last words), but there's no doubt in my mind that they are being asked. The Democrats in the Senate would be foolish not to. It never hurts to ask. The worst they can say is, "no," or maybe, "NO!" after the one hundredth time or so. Well, Pennsylvania got slightly bluer today with Arlen Specter's surprising, yet not-so-surprising shift into the Democratic Caucus in the Senate. The way things were going, this was likely the only choice Specter had. ...if he was/is still interested in working in the Senate. Twenty-one points down is twenty-one points down. That's a tough row to hoe when you are talking about an incumbent and a primary polling deficit. Not that Chris Dodd is in an ideal position, but at least his polling deficit is against a potential general election opponent in 2010; not quite as threatening. Specter, I'm sure, saw the writing on the wall. Here's one: Seth Masket over at Enik Rising sums the move up nicely. Here's another from Josh Marshall (via Seth): I completely forgot that Pennsylvania is a closed primary state. That certainly would have made Specter's prospects of re-election that much dimmer if he would have continued on that route. A couple of summers ago I took a grading gig within the department to help out one of our faculty members. It was an intro to American government class made up completely of incoming freshmen. So this was their first college experience. Following a week of lectures on the branches of government and their attendant checks and balances we had an exam. One of the questions asked was about the checks between Congress and the Supreme Court. We had that week discussed Senate confirmation of judicial appointments and nestled in that discussion was a side note about Specter's role in the Clarence Thomas hearings -- specifically his questioning of Anita Hill and the backlash that created. Now, you have the proper context, but it took me a while in the midst of reading all these exams to figure out who one the students was referring to when mentioning Karl Inspector. Then the light bulb came on: Oh, Arl-en Spector. Recently, Indiana Secretary of State, Todd Rokita, sat down with Howey Politics Indiana to discuss a wide range of things. Given that the secretary of state's office handles election administration in the Hoosier state, the talk ultimately turned to the 2012 presidential primary calendar. HPI: Have you had conversations with party chairs Dan Parker (D) and Murray Clark (R) about when Indiana will have its 2012 presidential primary? Rokita: I have and we hope to be able to study it this summer. Again, I am disappointed that the Senate resolution that crossed over to the House to do just that did not get heard, as far as I’ve seen yet. That’s OK, the Senate can do its own. I hope the Democrats come to the table. It was their party that benefited so much from having a contested primary this last year. Indiana mattered. That’s a great thing. I want it to be that way every presidential election. Let me clarify a few things about this exchange and augment them to some degree. First, SCR 28, the Senate resolution setting up a committee to study the wisdom behind moving Indiana's presidential primary in future cycles, passed the Senate and moved over to the House where it has stalled. Rokita says as much, but adds that it is the Democratic Party that is holding the measure up. And that is certainly in line with FHQ's thinking concerning 2012. Republicans are going to be more active in presidential primary frontloading than are Democrats simply because theirs is the party with the competitive nomination race. It is completely understandable, then, that the Republican-controlled Senate was able to move the resolution while the Democratic-controlled House basically refused to bring it out of commitee. Also, the clock is running out in the Indiana General Assembly. 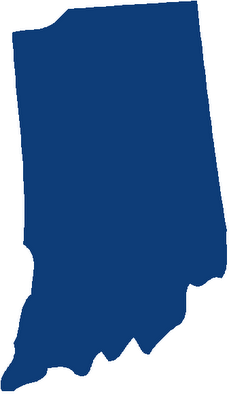 The legislature is slated to adjourn tomorrow (April 29), which means that it is all but assured that the Senate will be the only body in Indiana's state government studying a frontloading move for the Hoosier state's presidential primary. HPI: Do you think this is going to be a state-by-state thing or is there a chance of regional presidential primaries? Rokita: Since I am president of the national association (of Secretary of States) we’ve studied the regional primary and that’s the one you’ll see me continue to advocate as we rotate around the country. I think that has some very good implications to it. However, what I realized after going through a presidential election cycle with it, the parties really are the backstop. If the parties make some reform, like rotating regional primaries, they will make it happen. The Republicans are moving in that direction. They used to have very strict rules at a party convention. Well, the Democratic Party was able to have a Rules Committee on the fly so they can adjust in between their national conventions. You saw the Republicans move in that direction after Minnesota this past year. I’m hopeful, but it’s quite clear the parties will have to both agree on a plan if we’re going to have any reform in the nation. Ah, reform. Given his position as secretary of state, it is no surprise that Sec. Rokita is pushing the NASS Rotating Regional Primary Plan. That certainly isn't as interesting as his last statement. Let's look at that again: "I’m hopeful, but it’s quite clear the parties will have to both agree on a plan if we’re going to have any reform in the nation." As I've tried to make quite clear in this space, if reform is going to happen, it will have to be something that both parties coordinate. If only one party moves, the door will be fully opened to an exponential increase in the incidence of Florida and Michigan-type moves of defiance in the future. So, it is good to see that at least one person in a position of power has come to this realization. The extent to which that thinking spreads will dicatate whether we actually see primary reform or not. Is it me or is the inevitability of Charlie Crist's "I'm running for Senate" announcement not similar to the drawn out process that was Fred Thompson's presidential announcement in 2008? 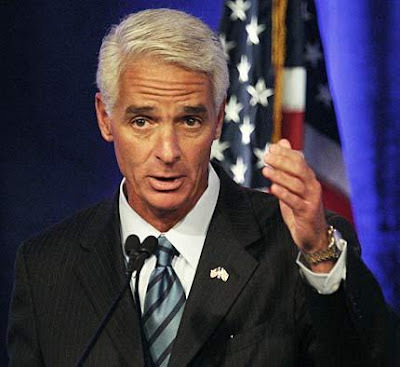 For the record, I think Crist will fare much better than the former Tennessee senator turned actor turned presidential aspirant turned actor. NOTE: It is also about time we put to rest the idea that the pictured hand gesture above is a prerequisite of being a decider. Yesterday Politico's Ben Smith and Jonathan Martin penned a piece on the growing divide between the Inside-the-Beltway Republicans and all the other Main Street Republicans out there. I don't want to read too much into that. After all, there was a similar divide in the Democratic Party in terms of a winning position on the Iraq War after losing the 2004 presidential election. * And 2008 isn't yet a distant memory. Though the divide wasn't necessarily issue-based, the intra-party division over the question of Barack Obama or Hillary Clinton was very real. My point here is that these apparent divisions can quickly take a backseat to the greater goal of winning elections. A schism in 2009 isn't the same as a divided Republican base in 2012. But this isn't really about a divided base. This is about party elites versus its rank and file membership. Again, electoral goals can make strange bedfellows, but they can also get all or most of a party on the same page with a startling quickness. I'm not, then, as concerned with the notion of an irreconcilable division within the Republican Party in the context of the 2012 presidential nomination race so much as I'm enthralled as a political scientist who studies these nominations by the rarity the political occurrence. There has not been this kind of battle for the party since the Ford-Reagan nomination race in 1976. As I've said, and as Nate Silver said just yesterday, Palin possesses the type of grassroots-level enthusiasm to make it interesting in the same way that Reagan did. And that just isn't something we get to witness all that often within the Republican Party: an elite versus rank and file battle. Will that happen? I don't know, but it will be fun to see whether it materializes. We don't often get the chance. *Of course the difference between what is happening with the GOP right now and what happened with the Democrats during the earlier part of this decade is that the war issue kept moving closer and closer to the anti-war protesters position. For the GOP, the immigration issue is a bit more muddled: respondents would rather the level of immigration stay where it is or drop, but generally like the idea of immigration. The situation is similar for taxes. On gay marriage, though, things are moving away from the (at least vocal rank and file) members of the party. I can buy Palin and Huckabee that low simply from an organizational standpoint. And when I say organization I mean the ability to win over party elites within the Republican Party. Despite both having at least some modicum of support at the grassroots level (Palin being Palin and Huckabee in polling), there's still the thought that neither has much of a link to the elite level of the party. You can get away with that in a Democratic nomination race (see Carter, Jimmy or Dean, Howard P. -- where the P stands for pre-scream), but that really doesn't happen on the Republican side. That's why those top two look so good. Bobby Jindal. I still see the Louisiana governor as the Mark Warner of this cycle -- dropping out before the race starts and eying another cycle. In fact, let's pencil those two in for the 2016 general election and be done with it. Nah. Eric Cantor. Look, I haven't said much about the Virginia congressman, but boy has his name been dropped a lot lately in the context of a presidential run. I don't know. I could be proven wrong, but I really see him as aspiring to the Speaker's position. The guy wouldn't turn down a chance at the GOP nomination, I'm sure, but I doubt he makes that jump unless he really feels like he can win it. His last name isn't Bush, so I don't see him queue-jumping around the "next guy in line" method of presidential nomination for the GOP. As Nate, said, the GOP is likely to lose ground on the presidential level, but gain at the congressional level without Texas on the map. But, I've got to admit that I can't just swipe those numbers and put them on my own map without making some original contribution of my own. Based on the Election Data Services data I used to put together these post-2010 census maps, I reallocated each state's congressional seats without the Lone Star state. This reflects the projection based on the population changes witnessed between 2000 and 2008. Arizona, Florida and North Carolina are the beneficiaries of Texas' departure, gaining two seats apiece and the funny thing among the states that lose seats -- the usual Rust Belt suspects -- is that most of them, after gaining from the hypothetical Texas secession, revert to their pre-secession, pre-2010 census numbers. 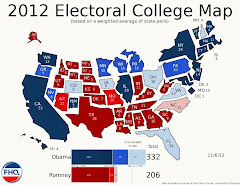 Ohio's back to 20 electoral votes. Pennsylvania's back to 21. New Jersey's back to 15. Michigan's back at 17. New York and Illinois luck out and actually gain a seat over where they are in reality now. The basic trend we are likely to see in 2010 is upheld here with or without Texas. The Sun Belt would gain electoral college clout at the expense of the states in the Rust Belt and stretching into the northeast. 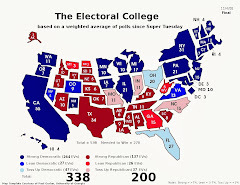 Instead of the 389-147 win without Texas (pre-census), Obama would have managed a 381-155 victory over John McCain under the electoral college vote distribution of this map. So no, I didn't resize the states to match their new electoral vote totals, but I think we'll have something to talk about regardless. Ah, if only it were that easy. Of course, that's all most will remember of this until the rematch between Murphy and Tedisco heats up in the fall of 2010, if then. For now though, Scott Murphy is the new congressman from New York's 20th district following Jim Tedisco's concession this afternoon. Murphy currently leads by 399 votes. I think it is safe to say that this one is marked by both parties as one of the most competitive House races for 2010. And I'll say this: The special election has been welcomed respite from all things unelectiony since November. See, we'll have a few things to tide us over until the general election campaigns this fall. 1) This poll, like PPP's 2012 poll in March surveyed less than 700 respondents. Again, for a national survey you'd prefer 1000 responses, but beggars can't be choosers for 2012 polling data this far in advance. I'm sure the good folks at PPP would rationalize the number since it is based on voters and not the population at-large. 2) Palin improved her share while Obama's share dropped when compared to the previous poll. Not to diminish how well the Alaska governor stacks up against Obama, but this poll was done on the heels of Palin's appearance at and subsequent news coverage of the Right to Life Dinner last week in Evansville. Still, knocking eight points off the president's advantage over her in a month's time isn't too shabby. 3) The unsures also aren't all that surprising. I think it is safe to say that Palin is in Hillary Clinton territory now: People either like her or they don't, but they do know (or think they know) about her and have an opinion. That's a situation where the "don't knows" drop. The differences aren't great across all four candidates on the not sures, but I was still surprised that Mitt Romney was bringing up the rear. That's both a good and bad thing for the former Massachusetts governor. Good because his number is likely to increase (as would anyone's) upon entering the race, but bad because some of those unsures are also likely to go to Obama (already at the 50% mark). 4) The unsures on the favorable/unfavorable for each of the Republicans is also worth looking at. 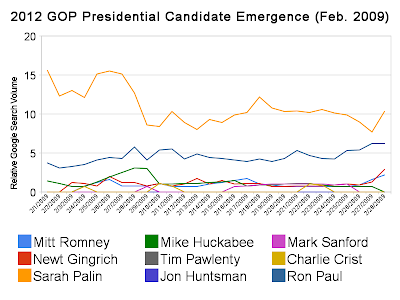 Palin is the only one of the four to have a not sure percentage in the single digits. The other three Republicans have not sures on that measure of 20 or more percentage points. That's pretty significant. Still, Mike Huckabee does the best against Obama. That's certainly news to me. News I'm hard-pressed to figure out. My conception of the GOP field broadly was that Huckabee and Palin occupied a similar, though not identical, area: similar on social issues, but different on economic matters. But now that I've typed that out, I get a sense potentially of why Huckabee did better against Obama than the other three. In the midst of a time when the role of the federal government on a host of issues is increasing, Huckabee is the Republican answer. And if the US is going in that direction, "why not have one of our own in charge of it," might be the Republican thinking. 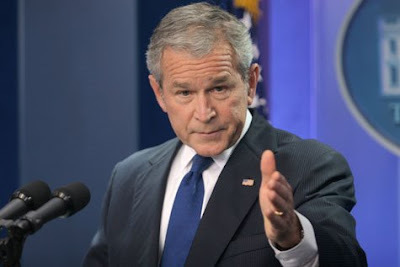 Of course, the argument could be made that George W. Bush was that type of president and some Republicans weren't particularly thrilled with the expansion of government under the Bush administration. Then again, I could be reading way too much into a poll concerning a race that is still three years away. Interesting results, though. Hat tip to GOP12 for the poll link. Last week FHQ happened upon a bill in the Texas House that would move the Lone Star state's presidential primary (and all other primaries) from the first Tuesday in March to the first Tuesday in February in 2012. Given the widespread adoption of that particular date by a host of states prior to 2008, this still doesn't qualify as big news. What's more is that Texas has done this before, moving from May to March for the Southern Super Tuesday in 1988. However, the state maintained that position for each of the elections between 1988 and 2000. Prior to 2004, the legislature moved to shift the primary up from the second week in March to the first week in March, but later postponed that move until 2008. Texas, then, technically just frontloaded its presidential primary for 2008 and is eying a more substantial move for 2012. Well, parts of the Texas legislature are eying such a move. As I said last week, the bill -- HB 246 -- is a Democratic sponsored bill in a Republican dominated state government. In this case, though, the in-party (the state GOP) is the party that will have the contested nomination race in 2012. Whether that actually causes state Republicans to act is beside the point. The real issue is that the Republicans in control have at least some motivation to move the largest red state inthe US to a more advantageous position for the 2012 Republican presidential nomination race. And now, some of these Republicans may begin to hear about the virtues of such a move from a group other than their Democratic colleagues in the state capitol. No, HB 246 hasn't been passed -- the bill is still in committee -- but there will be a public hearing held for it and a whole laundry list of other proposed elections legislation on Monday, April 27. HB 246 is first on the agenda though. Of course, being that this hearing is happening on a Monday, that it is one amongst a bevy of other bills, and that this is not a time (right after an election) when the public is particularly concerned with the next election, we may not see much action on HB 246. I suspect that on one side, someone representing the local elections officials, who would most be put out by the shift (deadlines and elections preparation would be pushed over into the previous year), would be in attendance as would potentially some conservative groups (on the other side of the issue) interested in insuring that Texas Republican voters have a say in who the national party's nominee will be. Regardless, it will be interesting to see what, if any, testimony is offered on Monday concerning moving the Lone Star state's presidential primary for 2012. I'll keep you posted as the hearing's details become available. "What's the best level to analyze the vote? Should we be looking at individual data? County returns? State returns? There's no obvious right answer here. Yes, individuals, not counties or states, are the ones that cast votes. But people are not islands. They often think as members of communities and evaluate political events in terms of their impact on their geographic area." In other words, voting takes place on the individual level, but one's sense of community and geography influences that. Voters are certainly more likely to latch onto fixed boundaries rather than those lines that are apt to change every ten years. But it goes beyond the simplicity of congressional districts vs. counties. People aren't necessarily tied together because of lines drawn in the sand or boundaries between county and county or state and state. The map below, for instance, from the CommonCensus Map Project is based on respondents' senses of spheres of influence -- of what major city has the most cultural and economic impact on the area you are in. And that opens up an entirely different set of questions or at least an alternate unit of analysis: the virtual boundaries of these spheres of influence. As was mentioned by Jim Gimpel over at the Monkey Cage, but without the visual, this ends up looking an awful lot like the various media markets across the country. And there's some truth to that. My natural inclination is to look at one of two places first: North Carolina and Georgia. In the case of the Tarheel state, there is a fair amount of overlap between the virtual spheres of influence boundary and the media market boundary. That's just the fragmented nature of the state; between the mountain, piedmont and coastal regions on the one hand and the three major urban areas (within the piedmont) -- Raleigh-Durham, Greensboro-Winston Salem and Charlotte -- on the other. Those boundaries hold up across the spheres map above and the media markets map below. Georgia, though, is a different story. The state is divided into several media markets, but Atlanta subsumes those in terms of influence across the Peach state. Interestingly, Brian Arbor in the comments to Gimpel's post draws a comparison between the idea of political/cultural spheres of influence and the loyal followings of various sports teams. "When I lived in San Jose and Sacramento, you would see the Sharks and the Kings everywhere. This did not seem to be because people in those cities were massive hockey or basketball fans, per se. They were fans of a professional team that had their city’s name on their chest. In San Jose and Sacremento, this helped create an identity beyond being just a bedroom community to San Francisco. Common Census has a Bay Area map among its regional maps, and shows some of this effect." 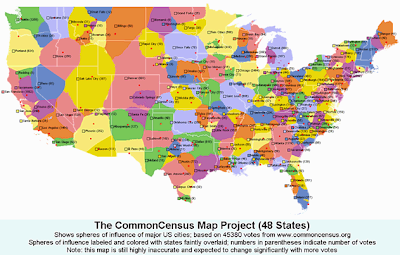 Whether politics, major cities or sports, though, this CommonCensus idea is an interesting one that forces us to reconsider the definition of boundaries -- thinking of them less in terms of lines and more so in terms of what ties groups of people or voters together. As I made abundantly clear during March, I like basketball. Growing up in North Carolina (and now returning!) will do that. But it is even better when there is an intersection between politics and basketball. I quite enjoyed, then, Obama filling out NCAA brackets or NPR constructing a bracket for prospective GOP presidential candidates in 2012. So when Coach K enters the political fray (even if not too deeply), I take notice. The Duke coach commented on Obama generally and the president's short tenure in office on Morning Joe this morning. And that certainly qualifies as such an intersection between basketball and politics. And a good one at that considering my position in the Carolina/Duke rivalry. Oh well, no more red state perspective from a life-long red stater. It is nice to go back home to the Tarheel state, though. 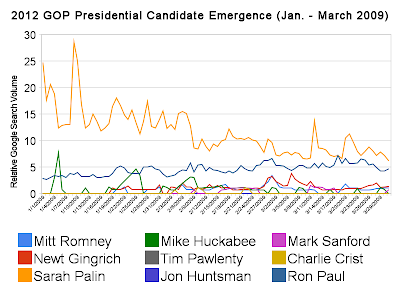 Now that FHQ has had a look back through the lens of Google Trends at Democratic (here and here) and Republican (here, here and here) presidential candidate emergence in 2008, I thought we'd cast an eye toward 2012. 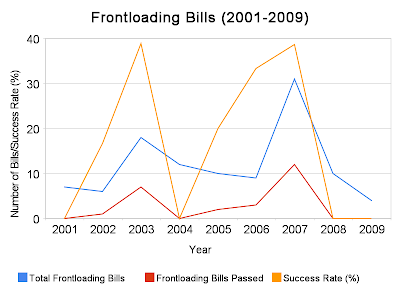 As was made clear in Sunday's post on frontloading bill trends since 2001, there is a cyclical pattern to this process as well. All is relatively quiet in terms of presidential candidate Google searches in years one and two of any four year presidential election cycle, but once the midterm congressional elections hit, the more candidate-specific searches begin to climb in number (just as in the case of the number of bills to shift a state's presidential primary). That's exactly the pattern that was witnessed between 2005 and 2008. In other words, the expectations for this current period in the presidential election cycle should be quite low. Hey, we just finished an election! Why think about the next one? Well, some of us are much to the chagrin of others. The bottom line is that we have to take these trends with a grain of salt this far out. But just for the heck of it let's take FHQ's Elite Eight for 2012 and add Bobby Jindal and Ron Paul. Now, it could become necessary to add (or subtract) someone in later (FHQ has had an internal debate raging about whether to include John Thune, for instance. ), but I'll leave it at these ten for the time being. There you have it. 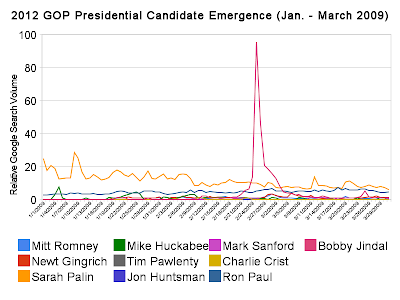 See, I told you that Jindal spike skews the data. All you can really see from that is the Louisiana governor having a really good day, Sarah Palin with a comfortable advantage over everyone for all but about a week, Ron Paul claiming a steady middling position and then everyone else clustered together. What's that really telling us other than Bobby Jindal was the talk of the town for about a week? Not much. So let's look at that January to March period without Jindal. Palin's one thing, but what about some of these other candidates? Let's zoom in on the first three months of 2009 individually. 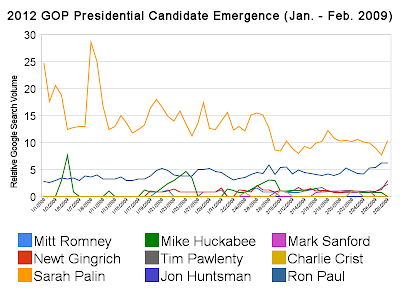 Mike Huckabee had some significant spikes across the month of January. 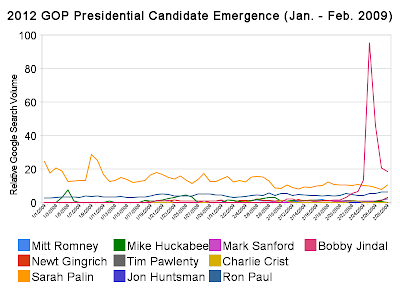 But he comes back to the pack in February (see appendix for a February chart with Jindal included). 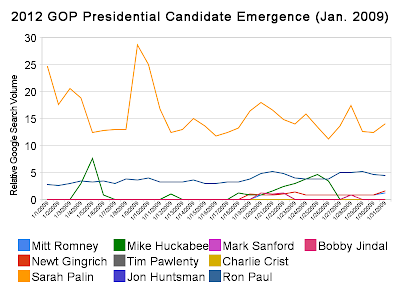 In the first two months of the year, a subtle (very subtle) advantage can be detected for both Mitt Romney and Newt Gingrich and there are some Mark Sanford (stimulus package-related) jumps as well. 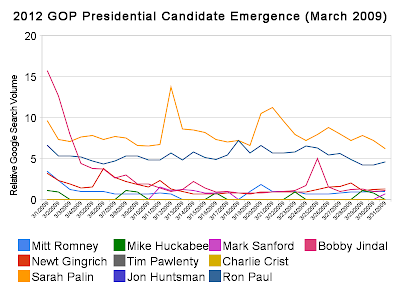 Once we zoom in on March and bring Jindal's data back into account, a Jindal/Gingrich/Romney grouping of candidates in the middle emerges with everyone else struggling to occasionally break from the no search barrier. That latter group includes Huckabee, Pawlenty, Crist, Huntsman and Sanford. 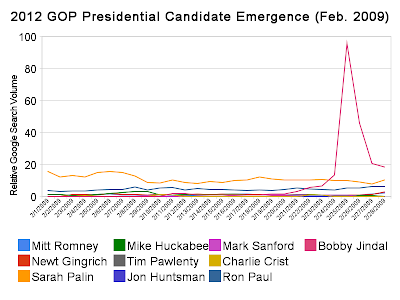 This Palin trend is one worth tracking. Her potential candidacy is one that could spur a huge grassroots effort. It is also true that latent grassroots support turned active could make her decision as to whether to enter the presidential race in 2012 that much easier. Still, her success will be measured by the extent to which the Alaska governor is able to, as I've said already, stay in the news and remain politically relevant. No one excites the Republican base better than Palin at the moment, but that excitement has to be met with the construction of some national level policy bona fides without which she'll be hard-pressed to convince Republicans mindful of her chances in the general election that she can win. That, though, is a story for another day. Below are a few more charts I put together but didn't fit in with the discussion above. But who am I to deprive FHQ's loyal readers of the visuals? There are three additional graphs. The first shows the February snapshot with the Jindal spike included and the final two show a January/February, two month snapshot -- one with the Jindal spike, one without. FHQ does an awful lot of talking about current bills before state legislatures that would shift the dates of presidential primaries, but that is a service often done without much context. Sure, we're likely to opine on the delegate-richness of a state or whether that state holds its presidential primary concurrently with its primaries for state and local offices, but there is often less discussion about the overall success rate of frontloading bills that are proposed in various state legislatures or when in a particular presidential election cycle we would witness the most success. 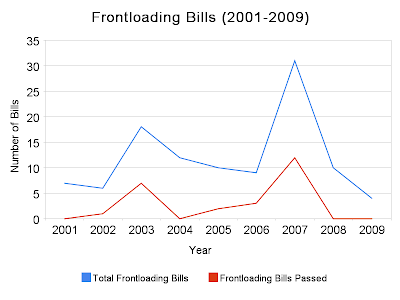 Using data from the National Conference of State Legislatures' Election Reform database, I tracked the frontloading bills proposed and passed in the time since 2001 (the point to which this particular database dates back). This examination only relates to frontloading bills, and not a wider look at any bill that would shift the date of a state's presidential primary. It should be noted, though, that the incidence of so-call backloading are few and far between during this period. There is also a distinction that needs to be made in terms of the longeity of legislation. Bills introduced, not acted upon and carried over to the next legislative session are not counted in the total column until they get an up or down vote on the floor or die in committee. New Jersey and Pennsylvania, for example, had a lot of frontloading bills that appeared in multiple sessions (same bill number across sessions). A similar situation happened recently with the bill to move Georgia's presidential primary back to March in 2012. The final caveat is that this only applies to states where the state legislature is charged with setting the date of the presidential delegate selection event. That obviously excludes caucus states, drawing down the overall number of frontloading states in the process. Still, as the results charted below show, there is a pattern to be gleaned from the primary data that will, in most cases, apply to caucus states as well. During this decade, then, we see that most of the movement in state legislatures on the frontloading front takes place in the year prior to a presidential election. As is the case with the public, legislators are not terribly concerned with the next presidential election until it is almost time for the next go-round. In terms of frontloading bills passed, this is an easy trend to track: There is a spike of successful activity (red line above) in the year before an election that dies down to nearly nothing during the election year (when many state legislators are thinking about their own reelection races) and then gradually grows over the next couple of years before spiking again just before the next presidential election year. That trend does not necessarily hold overall for proposed legislation (blue line above). In the case of introducing a bill, we see that the most activity is still in the years immediately prior to a presidential election year, but the activity does not tail off in the same way as it does for bills passed. For proposed legislation, there is seemingly a flurry of activity following a presidential election year. If we think of presidential election years as year one in the next cycle of frontloading, then we see some legislative activity (bill introductions) in the year of the presidential election (with the next primary cycle in mind and the just completed primary cycle experience still fresh) and that gradually trails off before bottoming out in the year of the midterm congressional elections. All that leaves is a simple relationship: The closer those two lines are to each other, the more successful state legislatures have been in moving their primaries to earlier dates. To get a better idea of this, let's superimpose the percent success rate over that previous graph. Now, we're getting somewhere. The biggest overlap between the original two lines is (bills proposed and bills passed) is in the years immediately prior to a presidential election year. That success rate drops off to nothing (or nearly nothing) during a presidential election year and in some cases the year after before building up again as the next primary season approaches. At its height, the success rate across this period still only approaches about 40%. In other words, the success rate improves in those years just prior to a presidential election year, but only about two out of every five frontloading bills is passed and signed by a governor in a good year. What does all of this mean? Well, for starters, all this talk about North Carolina and Oregon and Texas moving forward in 2012 is a bit premature in 2009. 2011? Yeah, they may have a better chance of succeeding then. But a lot of other states may be (and probably will be) considering moves by that time; states that are in better positions to move in the first place. It could be that what we're are seeing here are two groups of states: Those with comfortable unified partisan control waiting to move because they can, and states where divided government or governments controlled by the party in the White House continue to see legislators attempting to gradually gather support for a frontloading bill by continually reintroducing versions of it. Of the three states above, North Carolina and Oregon fall into the latter category. Texas, however, fits the former, but has a bill being pushed by a member of the minority party (which is the same as the party controlling the White House). All told, Rep. Roberto Alonzo might actually see some Republican support for the frontloading bill in Texas should it carry over to a future session or should he reintroduce it in the future (say, 2011). 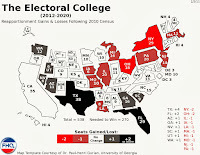 For the most up-to-date version of this calendar see the left sidebar under the 2012 electoral college projection or click here. Caucus states are italicized while primary states are not. States that have changed dates appear twice (or more) on the calendar; once by the old date and once by the new date. The old date will be struck through while the new date will be color-coded with the amount of movement (in days) in parentheses. States in green are states that have moved to earlier dates on the calendar and states in red are those that have moved to later dates. Arkansas, for example, has moved its 2012 primary and moved it back 104 days. You'll also see that some of the states on the calendar are live links. These are links to active legislation that would shift the date on which that state's presidential primary would be held in 2012. That allows us to track the status of the legislation more easily (in the states that allow you to link directly to the bill status). For the sake of tracking relevant legislation dealing with presidential primaries generally, but not the dates directly (ie: Minnesota potentially switching from caucus to primary), FHQ will include links in parentheses next to such states (H for House action, S for Senate action). A note on the placement of Iowa, New Hampshire, Nevada and South Carolina. *New Hampshire law calls for the Granite state to hold a primary on the second Tuesday of March or seven days prior to any other similar election, whichever is earlier. Florida is first now, so New Hampshire would be a week earlier at the latest. Traditionally, Iowa has gone on the Monday a week prior to New Hampshire. For the time being we'll wedge Nevada and South Carolina in on the Saturday between New Hampshire and Florida, but these are just guesses at the moment. Any rogue states could cause a shift. **In Arizona the governor can use his or her proclamation powers to move the state's primary to a date on which the event would have an impact on the nomination. 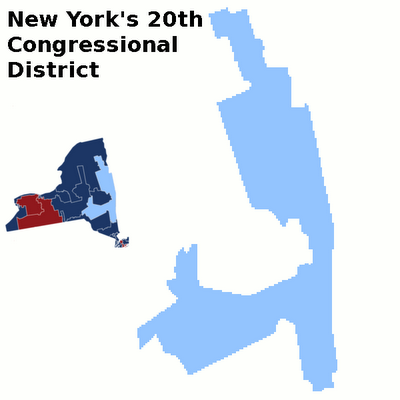 In 2004 and 2008 the primary was moved to the first Tuesday in February. ***Massachusetts and Michigan are the only states that passed a frontloading bill prior to 2008 that was not permanent. The Bay state reverts to its first Tuesday in March date in 2012 while Michigan will fall back to the fourth Tuesday in February. ****The Colorado Democratic and Republican parties have the option to move their caucuses from the third Tuesday in March to the first Tuesday in February. *****The law in New Mexico allows the parties to decide when to hold their nominating contests. The Democrats have gone in early February in the last two cycles, but the GOP has held steady in June. They have the option of moving however. A note on the Minnesota caucuses. With the action (or inaction) in Oklahoma on the caucus move (see here and here), another potential shift in the calendar was avoided. 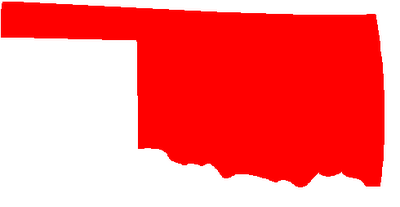 As it stands now though, the presidential primary in Oklahoma will be on February 7, 2012 as scheduled. Oklahoma GOP chairman, Gary Jones was reelected today. 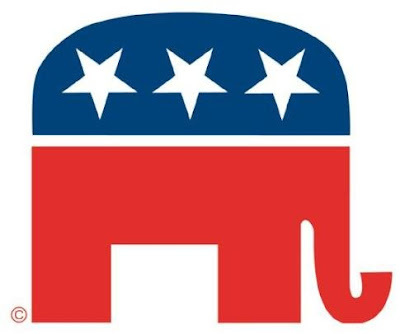 Delegates to the Oklahoma Republican Convention chose their current chair over vice chairman, Cheryl Williams by a nearly three to one margin (1282.4 to 461.6 -- Yeah, I don't know how those tenths of a delegate work either.). After the chair vote, one of Williams' supporters attempted to nominate her for her current position, but since she had not submitted her name for the office of vice chair, she was called out of order and was not among the group being voted on. The Oklahoma GOP, then, has the same chair, a new vice chair, and after a fully charged debate, will stick with the state's presidential primary in 2012. Ho hum; nothing to see here. H/t: Michael Bates for the tweets from Oklahoma City and the convention. As FHQ discussed last weekend, the Oklahoma 2012 presidential primary may be in jeopardy depending upon the candidate selected as the state party's next chairman. Current chair, Gary Jones represents the status quo (and a presidential primary in 2012), while vice chair, Cheryl Williams, and her supporters are advocating a switch to a caucus. As we pointed out last week, though, that Oklahoma is lost in the shuffle primary season in and primary season out is not about the state having a primary as opposed to a caucus. And the big names in the Oklahoma GOP seem to realize that. Sen. Tom Coburn, when addressing the convention, questioned the wisdom of taking up a caucus system and dropping the primary. The senator is also stressing the drawbacks of the potential division that could emerge between the two factions of the party. This chair vote today at the convention is seen as a proxy of the vote in the caucus/primary discussion. Usually, I'd say let's just sit back and wait for the results to come in, but we don't have to do that. I'm not a big fan of Twitter (It seems silly to an often verbose person like myself. ), but in real-time situations like this it can be useful. And believe it or not there are a couple of good Twitter feeds coming in from the Oklahoma GOP convention. BatesLine has the best numbers coming through right now, though. Here's a link to the feed. It looks as if Jones (and the primary) is gaining a pretty good amount of support in Oklahoma's rural counties. If I have time later, I'll put up a county-by-county map of the results. Now Obama's Fighting Climate Change Reform? I bet you thought this was going to be a secession post. * Nope, but I have to admit that I let this one slip through the cracks. A while back I touted the usefulness of the National Conference of State Legislatures' election reform legislation database. There really is a lot to see there. So much, in fact, that I've missed one Texas-sized frontloading bill. 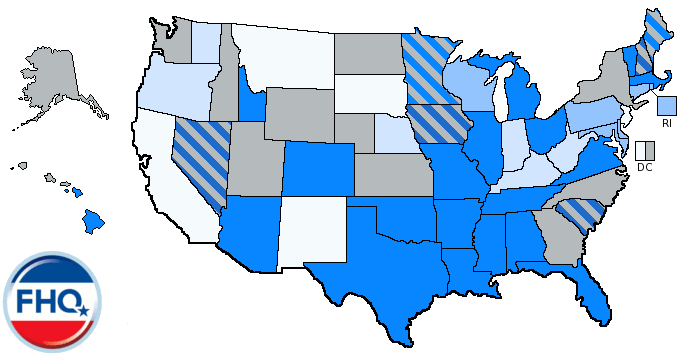 It turns out that some of the states that hold concurrent primaries (presidential primaries at the same time as primaries for state and local offices) are rather difficult to track when it comes to legislation shifting a state's presidential primary date. NCSL simply treats them as primary changes and not presidential primary changes. In other words, if you just search for those bills affecting presidential primaries, you may be missing out on some of the potential movement on the state legislative level. That burden, however, has not deterred one of the House sponsors of the 2007 bill from introducing legislation to move the Lone Star state's primaries (presidential primary included) to the first Tuesday in February for 2012 and beyond. Rep. Roberto Alonzo (D-Dallas) during the filing period last (gulp) November (Yeah, I really missed that one.) filed HB 246 to shift the state's primary from the first Tuesday in March to the first Tuesday in February. Still, we can put Texas up on the big board now to join the other handful of states that are actually looking into moving forward in 2012 and not back like a few others. It is more likely in Texas' case than in North Carolina and Oregon, I'll say that. * Speaking of secession, I couldn't resist the urge to draw up a Texas-less map. The electoral college map looks strange with that gaping hole and without the second of its Florida-Texas legs holding it up. The plan that made its way through the Texas legislature (HB 2017) to move the primary from the first Tuesday in March to February 5 did not fail because it didn't have bipartisan support in both chambers. It failed because of opposition from both in and outside the capitol. County election clerks fretted over the impact the move would have on local elections (Texas law requires that the presidential and the state and local primaries be held on the same date.). Office-holding candidates seeking higher office (including some in the legislature, no doubt) also protested because filing to run would take place in 2007 (the year before the election), which under the Texas Constitution would force them to vacate their currently held offices. The last action taken on HB 2017 was on May 23, just four days before the legislature adjourned. Sadly, the link to the story in the original post is dead now. I'll have to try to find that somewhere else and link it back here. GOP Going the Caucus Route in Oklahoma in 2012? Newt on 2012: "We'll See"
Georgia in 2012: Back to March?